In an overflow meeting at the Capri Theater, executives with Target Corporation engaged in a dialog about how corporate hiring policies prevent people with criminal arrest – disproportionately people of color – from securing a job. 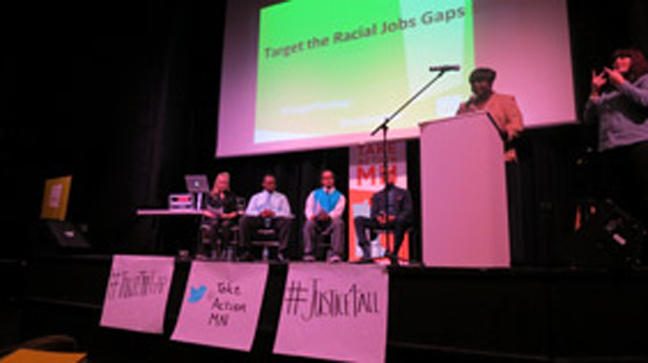 The community meeting was organized by TakeAction Minnesota through its Justice 4 All, fair hiring campaign. Jim Rowader, Target’s vice president of employee and labor relations, announced during the meeting that the company would institute a nationwide ban on the checkbox included on employment applications that screens for an applicant’s past criminal history. Officials with TakeAction said the move is a significant step in removing a key employment barrier for those with arrest records from one of the nation’s largest employers. McGrath said TakeAction Minnesota has worked for more than two years to build a base of leadership on the Northside to address inequities in employment. Nekima Levy-Pounds, an attorney, professor and activist, moderated a panel discussion between Rowader and three individuals leading TakeAction Minnesota’s Justice 4 All fair hiring campaign. The panel included Larcel Mack, a workforce coach at Emerge Community Development and small business owner, Ramsey County Workforce Solutions employment counselor Renee Zschokke and James Cannon who serves as a Ramsey County employment guidance counselor. During the panel discussion, Rowader also announced Target would be contributing $100,000 to the Council on Crime and Justice to fund the “Second Chance Saturdays” program in Minneapolis that helps those with past records navigate barriers to employment. Cannon, who is African-American, spoke of his own struggle to obtain employment after getting into a fight outside of University of Minnesota campus bar shortly before graduation. The fight resulted in a felony conviction and it took several years for Cannon to re-establish his employment credentials and obtain a good-paying job. Several at the Oct. 24 meeting, including Levy-Pounds, noted that while the $100,000 from Target is much needed and will be a boost to the Second Chance Saturday program, much more is needed to truly make the necessary impact in the poorer segments of the community. “Some could argue this is really just a drop in the bucket,” said Levy-Pounds who commended Target for the contribution but also noted the millions and millions Target donates every year to other endeavors. According to the Economic Policy Institute, Minnesota has the widest racial jobs gap in the nation and the worst recidivism rate in the country, with 61 percent of those leaving the criminal justice system returning within three years. More than 92 percent of employers use background checks to screen applicants, with as many as two-thirds refusing to hire applicants with criminal or arrest records, regardless of the time lapse since conviction or the relevance of such a record to the job for which applied. Zschokke, an employment counselor who specializes in finding jobs for those with records, told the audience she is a survivor of crime. Among the over three-hundred people in attendance Thursday night were numerous political and community leaders, including U.S. Representative Keith Ellison, State Senator Bobby Joe Champion, State Representative Rena Moran and several Minneapolis mayoral candidates including Don Samuels, Betsy Hodges and Jackie Cherryhomes. Justin Terrell, TakeAction Minnesota’s Justice 4 All program manager believes Thursday night’s forum is the beginning of a long overdue dialog.